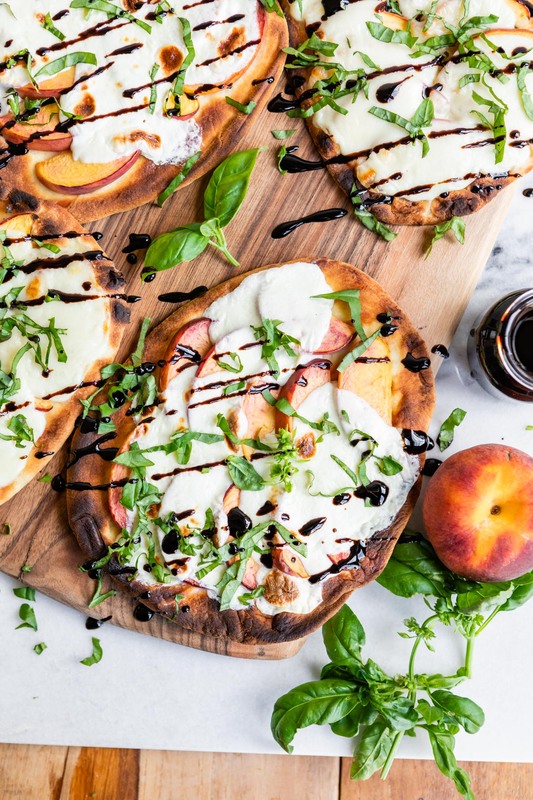 This may be a bold statement, but I’m pretty sure this Grilled Peach Caprese Naan Pizza is about to be your new favorite summer dinner. I mean, first: peaches! I don’t know about you, but when they’re in season, I feel compelled to include them in as many meals as possible. And when dinnertime rolls around, slicing juicy ripe peaches for a pizza is the best way to use them. And what pairs well with peaches? Fresh basil leaves–warm from the afternoon sun if you’ve got it growing in your garden–mild mozzarella, and a sweet-and-slightly-acidic balsamic glaze to bring it all together. Oh, and to make things even easier, you can layer them all onto pieces of naan. No need to mess with a pizza crust! The recipe calls for making these on the grill, which I highly recommend doing if you can. A little bit of charring on the naan really complements all those summery flavors. But if you don’t have a grill or don’t want to use it, these pizzas can be made under the broiler in your oven instead. When corn is in season, fresh kernels from the cob would be a delicious addition to these personal naan pizzas; I’ve also made them with and without toasted walnuts. The one thing I wouldn’t change about the original recipe is the glaze–don’t skip it! These days, you can pick up a bottle of balsamic glaze at the grocery store or you can do it the old fashioned way and boil down balsamic vinegar until it’s thick and syrupy. 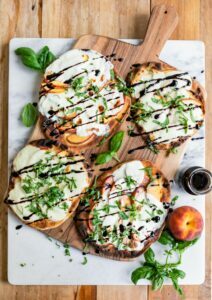 A fruity spin on caprese layered onto grilled naan then drizzled with balsamic reduction - and it only takes 15 minutes start to finish! Heat grill to medium. Brush both sides of each piece of naan with olive oil. Place the naan on the grill for 3-5 minutes, or until warm and just beginning to char in places. 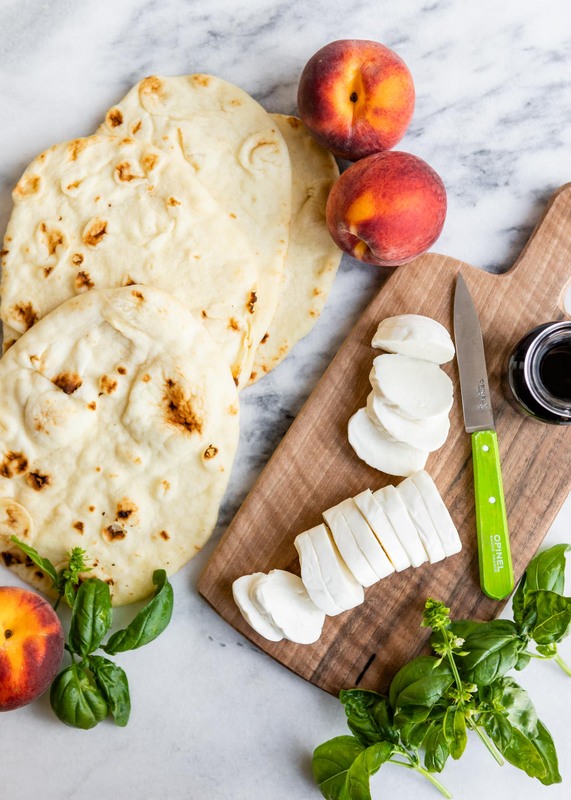 Flip the naan over and top with the mozzarella and peaches. Continue grilling until the cheese has melted and the naan is crisp, but not burnt. Sprinkle the pizzas with basil and drizzle with balsamic glaze. Season with salt and pepper, if desired. Cut into wedges and serve. You can make your own balsamic glaze or use store-bought.